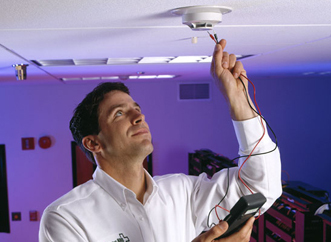 Installing a fire alarm system in your business is one of the best investments you can make to protect your business and employees from potential catastrophe. However a fire alarm system isn’t something you buy once and simply forget about; it needs to be frequently tested and inspected on a routine basis by licensed professionals. Frequent inspections by experts will not only help you save money with preventative maintenance, but might also catch a problem that would otherwise put your business and employees at risk. You want to make sure you and your business are safe. Unfortunately, some companies haven’t been as lucky. Having your property suffer from any form of damage puts things on hold until everything is sorted. If your business has gone through a similar incident, why not look into something like ServiceMaster by Zaba to take care of the restoration side of things, whether it is water damage or mold removal. Just like installing an alarm system, it is better to be safe than sorry. Today’s fire alarm systems can be easily integrated with your electronic security system, helping to keep your business safer. You can find a trusted and qualified security company that is a member of the Electronic Security Association (ESA) along with more business safety tips at www.Alarm.org. ESA members have the experience to work with you to design an integrated system to protect against fire as well as intruders. Members of ESA are security professionals that know how to keep your system in compliance not only with state and local regulations, but also with National Fire Protection Association (NFPA) standards. Of course, your system isn’t the only thing that needs frequent testing. You need to have a fire emergency plan written for your employees that they all know about and know how to implement in the event of a fire at your business. Taking steps to train your employees on what to do in case of a fire goes hand in hand with making sure your alarm system can detect that fire, and notify emergency responders as well. The safety of your workers come first, but isn’t the only thing worth considering when you’re planning a maintenance schedule. It may also be the law. Many state and local laws require fire system inspections to occur within certain spans of time, often depending on what kind of business you have and how many employees you have. Be sure to check with local fire marshals to ensure that your business and its fire alarm systems are in complete compliance with local and state regulations. If the unthinkable does happen and your business is the victim of a fire, a solid inspection record will also help with potential costs after the fact. Your insurance carrier mostly likely won’t pay your fire damage claim if you can’t show proof of regular inspections. That same proof of regular inspections might also net you a discount on your insurance, so be sure to contact your insurance broker once you’ve secured your regular inspections. One aspect you might not have taken into account is the occurrence of false or nuisance alarms. False alarms waste the time and resources of first responders, as they can’t tell the difference between a legitimate alarm or one caused by faulty equipment. False alarms can, depending on local ordinances, lead to fines that may also increase if they continue to be an issue with your business. Make sure your system is working as intended to avoid false alarms and to maintain a positive relationship with your local fire fighters and police. It is your responsibility and in your best interests as a business owner to protect your business and employees with a safe, robust and functional fire alarm system. Electronic safety and security professionals with an ESA-member company found here can help you design and integrate an alarm system that will work best for your need.